I have finished my vintage butterfly quilt. I love the colors in this quilt! 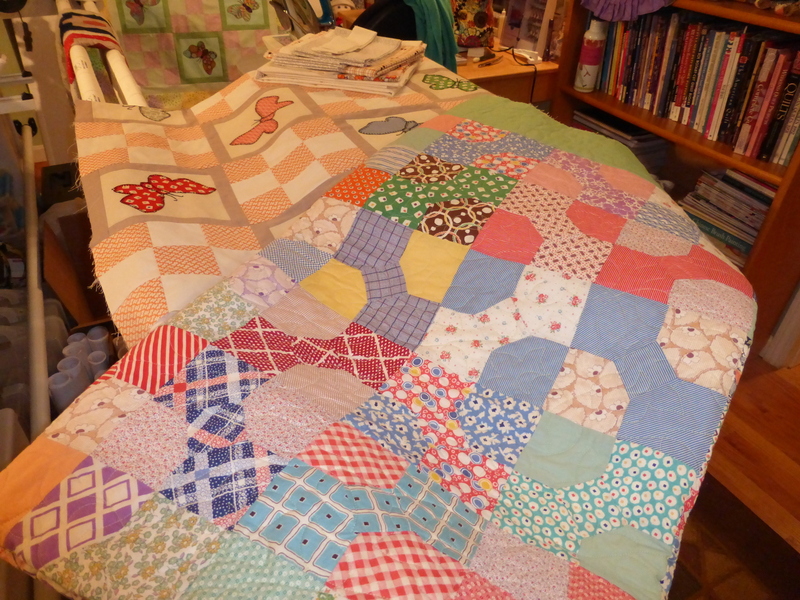 This is the quilt I made with my vintage 30’s butterfly applique blocks that were a gift from my Mother-in-Law’s friend. As I mentioned in my last post her friend Pat gave me some “quilted fabric” that turned out to be wonderful quilt tops and blocks that her mother made in the 30s. I saw Pat yesterday and she was very pleased with both quilts, but I could tell the Bow Tie quilt was calling to her, so I gave the finished quilt to her. She is going to give it to her mother for Christmas. He mother is in assisted living with short term memory loss. But, her long term memory is fine so I imagine it will be quite exciting for her to see her old quilt top again. At least I hope so! Maybe she will be wondering when and how it turned from a quilt top to a finished quilt! The Butterfly Treasure Quilt took all of my quilting attention for the last few weeks. Both it and the wall hanging version are finished. The wall hanging is made with some wonderful Kaffe Fassett prints, so it gives the 30s pattern a new look! The pattern for both is also finished now and for sale at Craftsy. This entry was posted in Applique, Patterns, Quilts and tagged 1930s quilt, 30s quilt, butterfly applique, butterfly quilt, kaffe fassett, nine patch, vintage, vintage quilt on November 23, 2014 by pmegio. 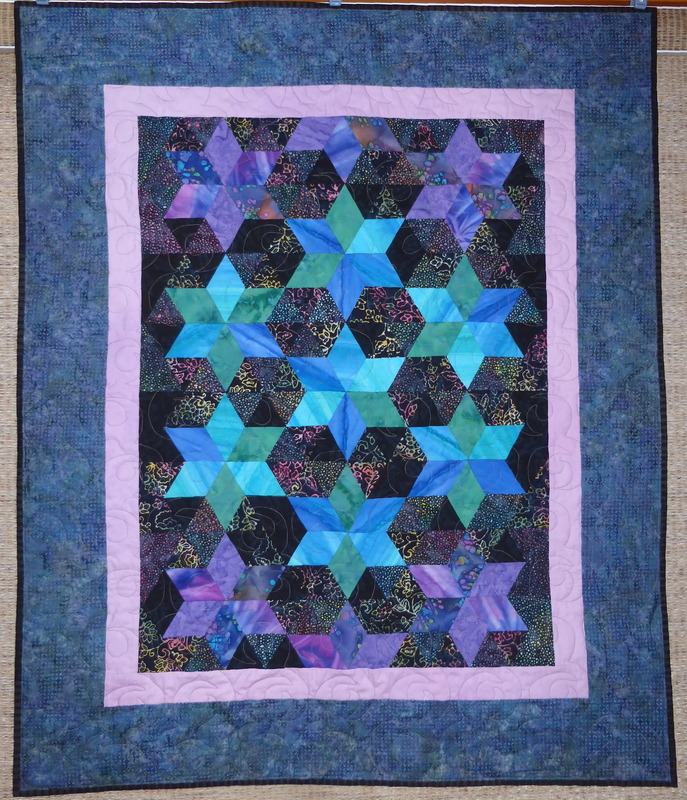 This is the second Tumbling Block, Hexi-Star quilt that I put together with Fabric Foundation. 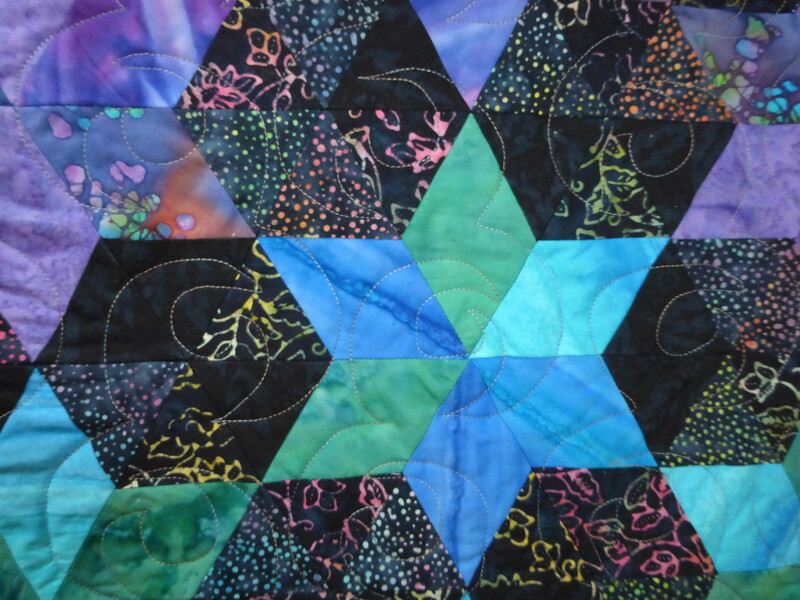 When I made the first one I was thinking I could piece one to emphasize seven of the stars for a Seven Sisters Quilt. I have a secret desire to make a traditional seven sisters quilt, but it will probably be awhile before I take that on. For now I have this little quilt. It is about 39″ x 35″ and the fabric gives this a genuine celestial look just like the Pleiades Constellation that the pattern is named for. I do have a seven sisters quilt top that I quilted. The top is a vintage top purchased on eBay so I don’t have any idea who made it and where it was made, but the fabrics look like 1940s to me. Hmmmm, looks like I need to find time to put a binding on that quilt! 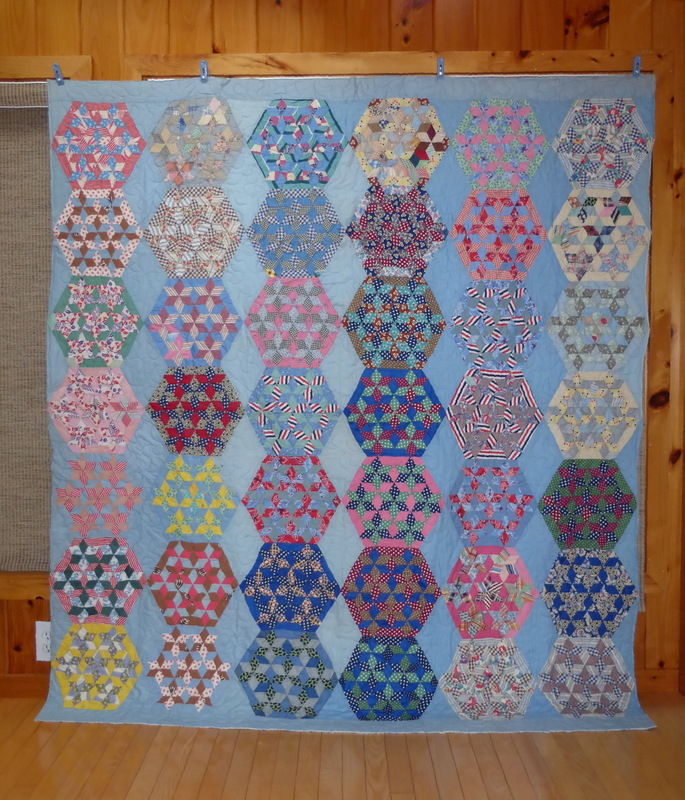 This entry was posted in Quilts, Vintage and tagged quilt, seven sisters, tumbling blocks, vintage on March 7, 2014 by pmegio.